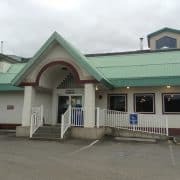 When seeking places to eat in Merritt, BC, none has more history than the Coldwater Hotel and restaurant. 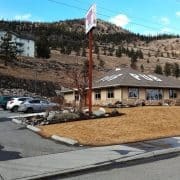 Situated in the heart of downtown at the corner of Voght St and Quilchena, the Coldwater has been a fixture of Merritt since 1908. Its conspicuous copper dome is visible throughout the city and highlights the downtown core. Originally, the hotel was located on the opposite corner. In 1910 it moved to its current location and has not stopped serving since! Today I am here to enjoy lunch! Co-owner Marla Reed was available to sit with me before ordering. We had a chance to talk about the restaurant. The first thing I noticed in our conversation is the pride Marla has in the staff. She says they are amazing and they are the secret ingredient that make the Coldwater special. She adds that the food is “the best in town”. Considering that the hotel can boast 110 years of continuous service, the staff surely are amazing to have earned the praise that Marla gives them! The Coldwater has three very distinct dining areas. The Coldwater Pub has 6 fresh, cold draught lines and a wide array of bottled beer to choose from. 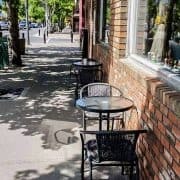 It is a large area with lots of tables, stools, and locals who are always eager to engage in friendly conversation. There are also pool tables and some of the best entertainment in town. Marla notes that the pub has not been opened up to minors. The Banquet Hall is the perfect setting for weddings, reunions, business meetings and special events. The Coldwater Restaurant serves breakfast, lunch, and dinner. The menu is extensive and includes regional favourites like home-made bannock. Ever tried a bannock taco? or stuffed bannock? Don’t miss out on these tasty items! 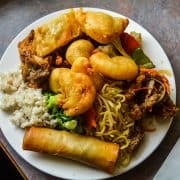 Looking for Indian cuisine in Merritt? Check out Experience Nicola Valley blogger Morgan Hampton’s visit to the Mughal Gardens. 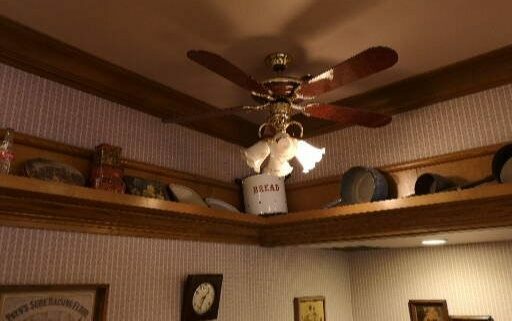 I was curious about the decorations. As a vintage bicycle appreciator, I find I am drawn to things old and antique-y. 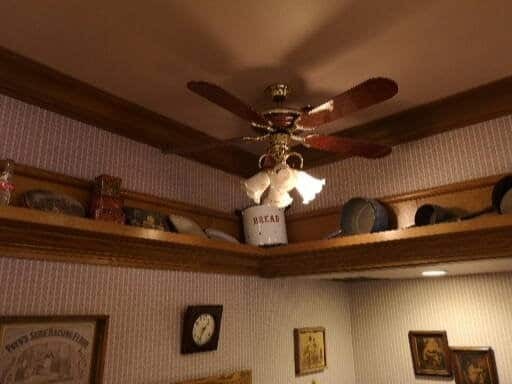 The Coldwater Restaurant is lined with antique bottles, serving trays, tins, flour urns, pots and pans, kitchen utensils, and many other pieces that you can imagine have accumulated over the past 110 years. Marla credits this aspect of the Hotel’s historic atmosphere to past owners of the hotel. I certainly appreciate their efforts! The Coldwater beer and wine store, the “Old Barley Mart” also boasts a collection of historical pieces, including saddlery, firearms, and swords! When the food arrived (and the service was speedy), I realized that I had over-ordered! 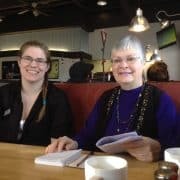 I wanted to try a couple of dishes, so I planned ahead and made sure to eat a light breakfast, but I was not quite prepared for all the food I received–the portions at the Coldwater Restaurant are plentiful! 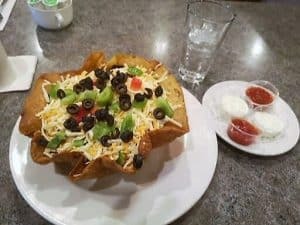 I had the taco salad and the stuffed mushroom caps. Everything was hot, fresh, and tasty–including the coffee! Refills were offered by the friendly staff without my having to ask, which I always appreciate! 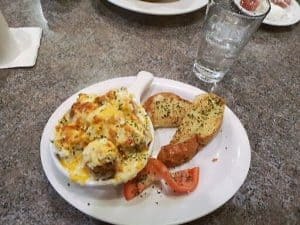 Enjoying the atmosphere of the Coldwater is a unique experience that I know anyone seeking places to eat in Merritt, BC would enjoy. Marla says that European and Australian tourists are frequent guests in the tourist season. I can see why. There aren’t too many places where a person can get a taste of historical flavour, while enjoying a flavourful meal. The artifacts I mentioned are a big part of that for me, but the entire atmosphere of the hotel is steeped in history. 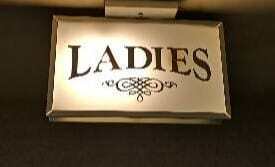 Just check out these washroom signs! When I look at these, the ear-worm is immediate. It’s Archie Bunker proudly lamenting the theme to All In The Family: “When goils were goils and men were men, those were the daaayyys!”.